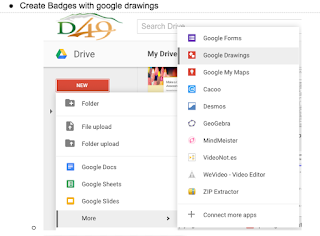 I was astatic to get the opportunity to attend my second EdTechTeam's Google Apps for Education (GAFE) Summit. I faced the same challenge as the first summit when trying to decide which session to attend. Having an amazing team helped make the process easier since we were able to divide and conquer when there was too many good sessions to choose from during any given time slot. As with my Fall experience, I left with an overwhelming amount of information to go back and implement this upcoming school year. I found myself geeky out a little more this time around. There were ideas that I attempted to implement last year but things didn't go over as smoothly as I would have liked. There were session that I attended that rectified my issues that caused so many aha and #mindblown moments. I am once again grateful to have been able to experience this epic time to grow, learn, and collaborate with fellow educators. The opening keynote was eloquently delivered by Holly Clark (@HollyClarkEdu) about Digital Disruption in education. Learning should be amplified by technology and textbooks should by used as reference points. She used the definition of disruption as interrupting the normal progress or activity of something with something better. Using that definition means that disrupting education is to interrupt or change the existing system and improve it. She talked about how Netflix disrupted Blockbuster which now no longer exist and how Uber is doing the same thing to taxis. She share an amazing video that you can find here or below. When you see a need you should make adjustments otherwise someone else will and you/your methods may become obsolete. She also talked about binge watching Netflix but we need to practice binge learning. When we as professional binge learn, we can't get enough of what we are learning (Similar to my GAFE experience; I couldn't get enough). We must create situation where our students binge learn, can't get enough of what we're doing in the classroom. We as educators must be restless learners. What is more important the answers or the questions? Traditionally education value answers, not questions but we must create an environment that is the opposite. Now is the time to to put the importance on questions and create Chief Questioning Officers. Her last point was about adjacent possibles. Adjacent possibles captures both the limits and the creative potential of change and innovation. With adjacent possibles in schools we must allow for student agencies which give students ownership of their learning and requires deeper thinking. We must begin by telling students the problem and asking them to solve it. She lit a spark in me like no other. Sara Stuhr (@mrsstuhr5th) did a great job at demonstrating how to use Twitter in the Classroom with her presentation, To the Twittersphere and Beyond. I've been wanting to use twitter in the classroom for a while now. Especially now that I am a 1:1 iPad teacher with unlimited possibilities but I've been really nervous about how the parents and administration would respond. I'm going to begin by taking baby steps. I plan to have different groups or individuals tweet daily with the hashtag #frommathrm202. First she addressed Student Engagement. She showed that this should be put in the students' hands and they should have ownership. Students should answer the questions: What do you want your parents to know? and What are you proud of? Twitter in the classroom should be used to document student learning by the the student. Students should be the force behind getting parents onboard. Tweeting should be a student job! A differnt student can post the tweet for the day everyday. One con was parent backlash because twitter is social media. She stressed getting media releases for each students and never posting pictures of students when the parent does not give permission. I was not really sold on all the pieces of parent engagement. I do feel that this peice is beneficial when parents are active on social media or twitter. 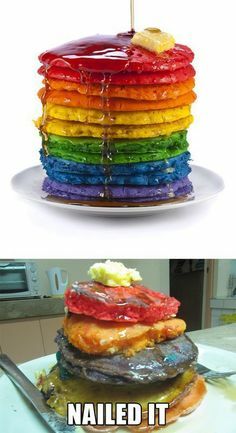 Ways to get the parents involved. Set parents up and explain how to use it. Make it apart of the school culture. 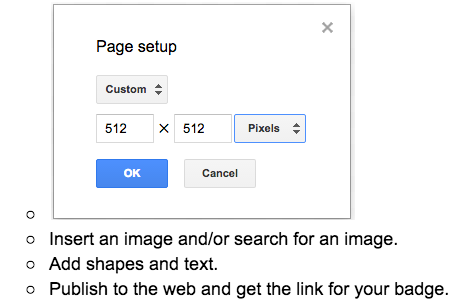 Make sure their are media releases for students' photos and always respect student privacy. Twitter can be used to building your PLN. Follow popular education hashtags to find other educators you may be interested in following. Tweetdeck.twitter.com is an amazing tool to multitask on Twitter. You can follow particular hashtags, messages, mentions, and twitter activity all in one place on one page without having to click through different pages or links. 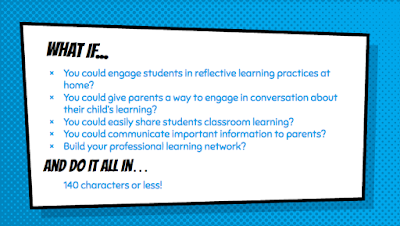 Twitter Chats can be used with your students or within a professional community. There is a question posted with a hashtag. Individuals answer the question using the same hashtag. One of my favorite session by far was with Daniel Sharpe (@get_sharpe) in Digital Badging: Level Up Your Classroom Google. I tried this last year but only ended up using the leaderboard but his explanation and method simplified the entire process. The way he has it set up also put it back on to the student which I love. Not only did he sure the sheets with the attendees but he also walked us through a very quick and easy process of creating badges with Google Drawings. First, copy the Teacher and Students' sheets templates. You can find both using the link above. 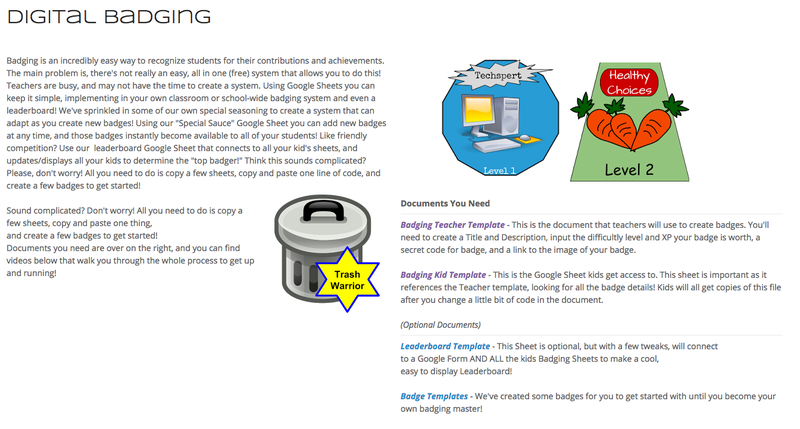 Then you type the badge information in the teacher template. The beautiful thing about this step is that you can edit it all year and any changes made would automatically update on the student template. I love that I don't have to have all my badges on the 1st day because the students will be able to see all updates changes. Now may favorite part about this, CREATING THE BADGES! He has a video tutorial for the process but it was so simple that I got "geek"bumps in my excitement. After you create your badges and create unique codes for each one, you are done! Sit back and watch the magic transform your class. There is one thing that I am trying to work out. With the power in the students hands you give them the unique codes for the badges they earn. 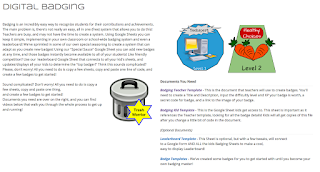 Students can share the code with peers who have not yet earned badges. I am working a formula that with change the digits to starts after entered. Fingers crossed that this will be possible. I enjoyed ePortfolios for Learning Using Google Sites with Nancy White. Letting students take ownership of portfolios. Allow the students to reflect about why certain artifacts were chosen. At the beginning of the year, students should reflect of learning goals for future self assesement. She provided a planning template: https://drive.google.com/file/d/0ByzloTthg-EVOVNXZnl1ZmdsSDQ/view The most valuable nugget I walked away from this session with is now knowing that you can create templates for sites that are as easy as fill in the blank to allow students to have uniform portfolios while still allowing for creativity and personalizations. Screencast Your Way to a Flipped Classroom with Brianna Mazzella (@BriMazzella) was very help as I am continuing my effort to flip my math class. She also opened my mind to untraditional possibilities that do not normally come to mind when you think about a flipped class. Screencastify is a wonder chrome extentsion that with make flipping you class a breeze if you plan to make your own videos. You are able to record a video of yourself, your voice over a document, site, or image, or your live desktop with yourself in a frame. I have not used my laptop for video yet but I look forward to testing it out within the next couple of days. 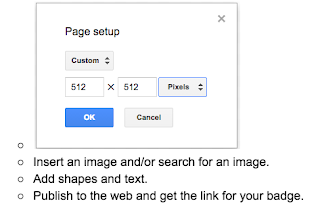 Allow the students to create their own screencast. 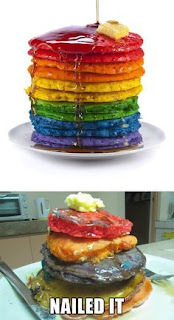 Flipped learning looks different in different situations. Students can view the video at home. The opening Keynote for day 2 was amazing. Jay Atwood (@jayatwood) spark my interest with his keynote on Instructional Identity Crisis. He began with these Four Pillars when it comes to educators teaching in the digital age. He introduced me to The Selfie Game. Sounds interesting. Take a selfie to match a topic or title. We must setting SMART goals. Growth is better than you were yesterday no matter how little the change. You can’t be positive and contributing if you are stagnant or confused, a lesson we can all live by. Sunk Cost Fallacy: You spend the most time on things that are important to you. Used to be "Show your work" now it’s "Share your work." Value is not in what you own, it’s in what you share! I'm considering puting this on my wall for motivation. 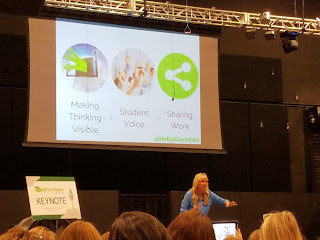 The Google Infused Classroom with @HollyClarkEdu was eye opening. I was able to add several more little goodies to my teacher tool box. How do you hear from every single student? Let’s Recap is a wonderful tool for all device to student to video record responses to questions, passages, or videos. I most excited to try this little gem out. Can't wait to share the outcome after I use this with my students. I most excited about Showcase your Style with Sites and Blogger with @cmoor4 since I have been trying to figure out smooth way to incorporate blogging into my classroom. 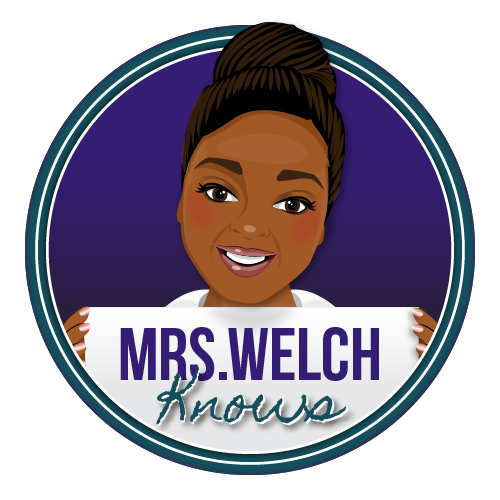 Last year KidBlog switched from free to paid after I set my students up and I did not want to introduce my students to a new platform so I put it off for a another school year. One of the most valuable things I learned for this session was that giving your students a global audience was as easy as tweeting a hashtag. Share your students work with #commentsforkids! Chris described sites are more uniform for portfolios while suggesting that blogger be used as blogs to document day to day in the classroom. Create. Annotate. Publish was a high energy session presented by @benjaminfriesen. Put the responsibility in the hands of the students. GreenScreen (Google App) can be used to put any background behind your students in a photo or video. Remember: You are not the sage on the stage. Let your students do the work (dance on the stage). Aides in the learning process. Data’s not so Scary with @jayatwood made me rethink the possibilities about using Sheets in the classroom. I am a data person and I have many ways for using sheets with add-ons and forms to collect data from my students that I use for planning for myself. Jay introduced me to new concept of having my students use sheets in class. I even had a conversation with my ELA half, @aadamsELA, about how she could use sheets in her class with writing and students are about to see all the statements in the sheet added via forms and collaborate or vote on their peers' responses. bit.ly/jraDATA is a very useful spreadsheet shared with the participants to demonstrate the many uses. The closing keynote given by @smbeaverson https://twitter.com/smbeaverson was phenomenal. He started with the 4C's. 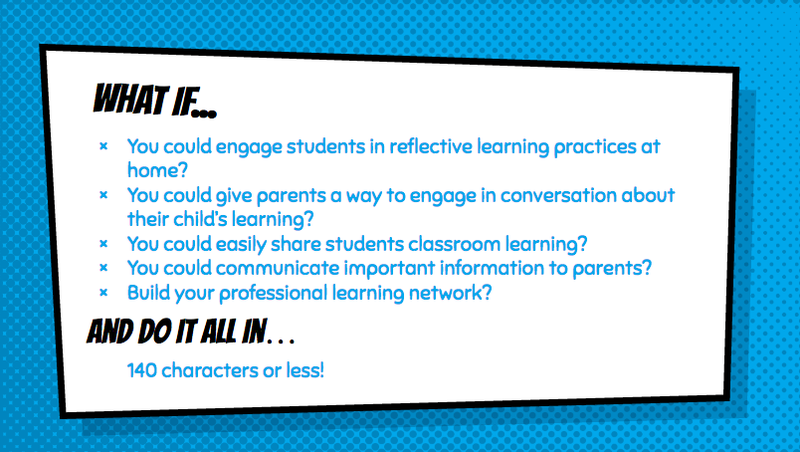 We as educators much think, "How can we use the 4C's everyday?" I love the idea of offering quiet moments of creativity during the day in every single class. Is that something you think you can do? I am working on it. LOVE THE IDEA OF A STUDENT TECH TEAM! The Student Tech Team realy gave me geekbumps! I plan to work with @historicalipad to get this idea off the ground at our school. Currently every 2 days we create as much information as had been created up until the dawn of the year 2003. Replacement: Do the same thing but using a different tool. Transformation: Focuses on the students, student centered. Take risk and lead forward into the new ways and allow the students to work with it that will surprise you. Using RAT we put the learning into the hands of the students by being innovative and allowing the students to choose. I am looking forward to implementing RAT in my class this year. This post was a mouthful and I hope you were able take, if not many, at least one gem away from my experience at the my second GAFE Summit. Leave comments below. I'd love to here from you. Help me create a Future Ready Classroom!